This study descriptions of the development the chondrocranium in Stenodactylus slevini (Squamata: Gekkonidae), Chondrocranium cartilage is one of the important things for evolution of the vertebrate head. The stage of embryo development was determined by length 21.1 mm, based on the hatched embryo, and cleared and double- stained specimens. it has been used reconstructions by serial sections to formation and description in some regions: the olfactory region, orbital region, floor of the neurocranium and auditory region. the olfactory region in this stage is reduce developed and the fenestra olfactoria is to large, the cupola anterior and parietotectal cartilage and paranasal cartilage connected to each other, sphenethmoid commissure also reduced development, present a features Jacobson's organ, it's chemical sensory organ that transfers pheromones to transmit signals between one species. The planum supraseptale is not yet formed but medial and lateral portion of planum supraseptal present. In addition, the Taenia marginalis, taenia medialis, and pila metoptica that represent the roof of chondrocranium. The auditory capsule is small and reduced developed, they are no connected with each other because the tectum synoticum is absent. Reptiles are among the commonest tenants of parched territories and have for some time been utilized in biogeographic, ecological and evolutionary research , comprising along these lines astounding models to examine how assorted variety is begun and kept up. A few instances of faunal trades in the two headings between North Africa and Arabia have been substantive [2-4] showing that there is certainly not a solitary example, but instead various theories counting both vicariance and dispersal, energetically dependent on the surveyed time range of the proceedings. As a Stenodactylus contain a nearly few quantities of species contrasted with other gecko collection in these zones, similar to a Pristurus, Tarentola or Hemidactylus [5,6] it's generally abnormal state of asset dividing, and territory specialization has enabled the diverse species to effectively colonize every accessible living space in the parched and hyper-bone-dry areas of North Africa and Arabia. It forms in this manner, an exceptionally fascinating, but yet few studied, a genus that makes a superb example of the realization of desert biodiversity and biogeography. Geckos are a little nimble shape that is chiefly nocturnal. A significant number of them have viscid cushions on their feet, produced using furrowed scales, and they can keep running about on the dividers and roofs of houses. They are existing in all regions excepting Antarctica. Pygopodids, close relatives, their forelimbs absent and hindlimbs reduced. They are located in Australia and New Guinea . A neoteric phylogenetic research with full taxonomic samples specific that the genus most likely began in Arabia . Though greater of the Stenodactylus species were described before the 1960's and a morphological alteration of the social affair was finished in 1980, starting late there have been different examinations develop both regarding morphological and molecular acquaintance, some of which have similarly proposed taxonomical changes [9-11]. The chondrocranium is the cartilaginous basic structure of the skull that begins arising early in developed and fills in as a platform around which dermal bones emerge and from which the endochondral bones harden in the skull. This structure is regularly very complicated in early prehatching stages, yet as development proceed and hatchlings ripe, this structure normally is supplanted by endochondral bone, to a great extent lost by ingestion and changed by development to the grown-up morphology. Provides structural support for brain and sensory capsules, including nasal, optic, and otic capsules; sensory capsules are joined towards the midline and among principal and back portion of the skull by the trabeculae, interorbital septum and back orbital cartilages, which frame significant parts of the orbitotemporal region . The morphology of the fully formed of chondrocranium of the Lacertilia might now be seen likewise known. There are various broad works in the writing concerning this topic. There are two old broad works managing the improvement of the chondrocranium of Lacertilia, by De Beer  and EL-Toubi and Kamal . The chondrocranium of Lacertilian has been described by several authors, as regards the family Geckonidae are interesting family of lizards, there are many works found concerning the chondrocranium or some structure from it, Tropiocolotes tripolitanus, Ptyodactylus hasselquistii , Psammophis sibilans , Acanthodactylus boskiana , Malpolon monspessulana , Agama pallida , Ptychoglossus bicolor , Mabuya , L. viridis and L. agilis . This study includes two main axes as an example of the Gekkonidae family. first, a comparative study of the development of chondrocranium growth by tracking the stages of embryonic growth until it reaches the optimum stage to find out timing and sequence of cartilaginous development. Second, the comparative analysis between the chondrocranium of the study sample and some other geckos and lizards with snakes and turtles studied previously by the authors to clarify the characteristics of the genus followed by these embryos, according to the characteristics of the chondrocranium and its formation. Egg samples collected from one special frame in Jizan city, which located in South of Saudi Arabia. Firstly, we have removed all embryos body from the egg and then cut the head to put it in in 10% formalin and in Bouin's liquid for around 24-48 hr. secondly, wash the examples from by 70% alcohol from the fixation and then dehydrated. thirdly, the specimens were stained in toto with borax carmine, and using paraffin wax to embed it. Finally, were cut it a transverse arrangement segment at 5 μm utilizing a microtome were stained with picroindigo carmine and afterward staining with hematoxylin and eosin, then the examiner by using a light microscope to examine. For graphic reconstruction using Ken-a-vision micro projector [22,23]. Total body length: 21.1 mm (Figures 1-3). Descriptions start to end of the head, the chondrocranium of Stenodactylus slevini is Described in three regions: an olfactory region, an orbital region, a floor of the neurocranium and auditory region. Figure 1: Graphic reconstruction of the fully formed chondrocranium of Stenodactylus slevini in a dorsal view.. 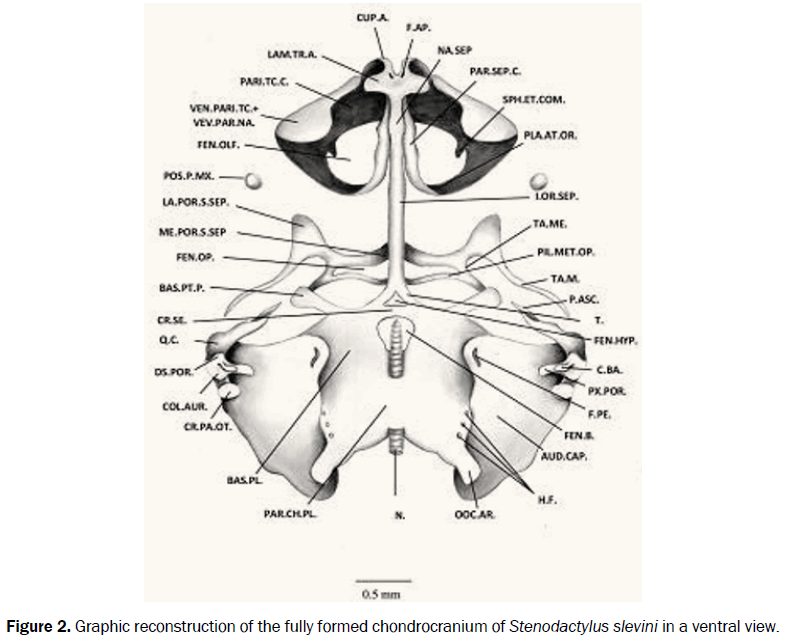 Figure 2: Graphic reconstruction of the fully formed chondrocranium of Stenodactylus slevini in a ventral view.. Figure 3: Graphic reconstruction of the fully formed chondrocranium of Stenodactylus slevini in a lateral view.. The olfactory region: The olfactory region begins with the nasal septum (NA.SEP. ), which separates the olfactory capsule (OLF.CAP.). It is a medium-length barrier and unfenestrated. The olfactory capsule is located at the anterior end of the olfactory region. The two-cupola anterior (CUP.A.) are formed separately from the nasal septum. Each cupola anterior is perforated from the central ventral area, known as the foramen apical (F.AP. ), which through ramus medialis of ethmoid nerve (Figures 2 and 4A). Figure 4: A: A cross section of the olfactory region show the nasal septum, and two-cupola anterior formed separately from the nasal septum. B: A cross section of the olfactory region show the parietotectal cartilage on both sides of the front end of the nasal septum and lamina transversalis anterior shown as a rudimentary cartilage at the bottom of the olfactory capsule. 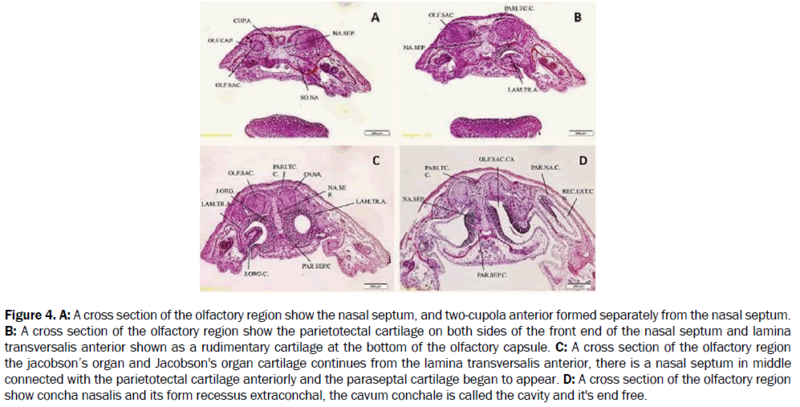 C: A cross section of the olfactory region the jacobsonÃ¢ÂÂs organ and Jacobson's organ cartilage continues from the lamina transversalis anterior, there is a nasal septum in middle connected with the parietotectal cartilage anteriorly and the paraseptal cartilage began to appear. D: A cross section of the olfactory region show concha nasalis and its form recessus extraconchal, the cavum conchale is called the cavity and it's end free.. The parietotectal cartilage (PARI.TE.C.) is formed on both sides of the front end of the nasal septum, it extends out dorsally on both side above the olfactory sacs (OLF.SAC.) which forms the semi-front roof of the olfactory sac. The lamina transversalis anterior (LAM.TR.A.) shown as a rudimentary cartilage at the bottom of the olfactory capsule. The plate connects from the posterior end to the nasal septum, while it connects from the anterior end to the cupola anterior and from the ventral area of the solum nasi (floor of nasal capsule) (SO.NA.) and is primitive (Figures 4A and 4B). Reptiles are characterized by a distinctive structure known as Jacobson's Organ (J.ORG.) or by the vomeronasal organ, which appears in this sample as cartilage between the paraseptal cartilage (PAR.SEP.C.) lamina transversalis anterior, It is a sac or a crescent-shaped channel that is convex to the outside and is implanted into the inside by the plate with a groove called Jacobson's Organ cartilage (J.ORG.C. ), it's a chemical sensory organ that transfers pheromones to transmit signals between one species, It also distinguish prey and avoid prey and helps in the process of reproduction (Figure 4C). When examining cross sections observe formation cartilage next to the parietotectal cartilage known as the paranasal cartilage (PAR.NA.C.) and fused laterally with it. the paranasal cartilage is a primitive cartilage that is not fully formed and appears in the shape of an oval and is divided into the dorsal part to the outside and abdominal part to the inside, the dorsal part is separated from the ventral part by a large cavity. The dorsal plates of parietotectal cartilage and paranasal cartilage forms the dorsal portion of the paranasal cartilage combine with the dorsal edge of the parietotectal cartilage (D.PAR.NA+D.PARI.TC.). Similarly, the ventral part of the paranasal cartilage combines with the ventral edge of the wall-shaped parietotectal cartilage (V.PAR.NA+V.PARI.TC.) (Figures 1 and 2), which is the primitive part of the nasal shell wall concha nasalis (CN.NA.) and form incomplete conchal wall (ICOM.CN.) and its form recessus extraconchal is (REC.EXT.CN.). The cavum conchale (CV.CN.) is called the cavity and end free (Figures 1, 2, 4D and 5A). Figure 5: A: A cross section of the olfactory region show the parietotectal cartilage fused with paranasal cartilage, the concha nasalis form incomplete conchal wall and its form recessus extraconchal, the internal nostril opening in the olfactory sac cavity. B: A cross section of the orbital region show the beginning of the interorbital septum between eyes, the paraseptal cartilage extended posteriorly to connected with the paranasal cartilage. C: A cross section of the orbital region show the medial portion of planum supraseptale on both said of interorbital septum. D: A cross section of the floor of the neurocranium show the basal plate and Fenestra basicranialis.. The dorsal plate forms the lateral dorsal wall of the olfactory capsule and continues from the posterior edge to end with two ends, an intermediate end extending from the parietotectal cartilage and the interior portion of paranasal cartilage to the sphenethmoid commissure (SPH.ET.COM.). The sphenethmoid commissure is a rudimentary cartilage end free from posterior edge. The lateral end ends with the planum antorbitale (PLA.AT.OR.) or lamina orbitonasalis, which extends from the paranasal cartilage. It forms the hind wall of olfactory capsule. In the last quadrant of the basal plate (BAS.PL.) there are three small holes called hypoglossal foramina (H.F.). The fenestra olfactoria (FEN.OLF.) is large and observed in the posterior half of the olfactory capsule (OLF.CAP.). It is bounded by the front of the parietotectal cartilage and from the middle of the nasal septum, on the posterior side are the planum antorbital and finally the two lateral sides the dorsal wall of parietotectal cartilage and paranasal cartilage. Posterior Processes Maxillaries (POS.P.MX.) appear as a small spherical cartilage that is completely separate from olfactory capsule (OLF.CAP.) and located on both sides of the cartilaginous skull. In transverse section ventrally, from the olfactory capsule observed internal nostril (IN.NO.) opening in the cavity of olfactory sac (OLF.SAC.CA.) (Figure 5A). The interorbital septum (I.OR.SEP. ), which extends from the posterior end of the nasal septum, it’s a medium-length stick located between the eye (E.) and the beneath the forebrain (Figure 5B), this septum connected posteriorly by the trabeculae communis (T.C.). The appearance of cartilage on both sides of the interorbital septum connecting them in the middle is called medial portion of planum supraseptale (ME.POR.S.SEP.) which runs back through a thin horizontal stick until attached to the lateral part of lateral portion of planum supraseptale (LA.OR.S.SEP.) (Figures 1, 2 and 5C). the lateral part of lateral portion of planum supra-septale is connected from its outer back end of the Taenia marginalis (TA.M.). It is a horizontal bar that ends free and is close to the auditory capsule (AUD.CAP.). The rear end of the interior connected to the middle bar of taenia medialis (TA.ME.) which extends horizontally until it connects to the central pila metoptica (PIL.MET.OP.) which ends in two ends are joined together in the middle to form the subiculum infundibula (SU.INF. ), which extends forward to be cartilao hypochiasmatica (C.HY.CH.) (Figures 1 and 3). These cartilages are located above the trabeculae communis (T.C.) dorsally, and extends laterally outside to end free end and is located above the basipterygoid process (BAS.PT.P.). in this stage there is one hole seen the fenestra optica (FEN.OP.) It can be seen from the lateral view only, a large elliptical hole, it is bounded from the anterior by the interorbital septum, back by pila metoptica, above by taenia medialis, and beneath via Cartilao hypochiasmatica. Floor of the neurocranium and auditory region: The trabeculae cranii (T.) appears as two separate cartilages extending forward to join together to form the Trabeculae communis, extending from the posterior end to combine with the basal plate (BAS.PL. ), which appear as two separate process (Figure 5D). Fenestra hypophyseis appear (FEN.HYP.) as a triangular shape, small opening, followed by a Fenestra basicranialis (FEN.B. ), which is larger in size than the fenestra hypophyses, separated to each other by a short cylindrical piece known as crista sellaris (CR. SE.). There is cartilaginous extends on both said from the posterior edge of the trabeculae cranii known basipterygoid process which connects between tow trabeculae cranii and basal plate. The basal plate represent represents the bottom of the skull and located between located between the auditory capsule. Notochord (N.) appears a short distance away from the end of the crista sellaris and pass through Fenestra basicranialis. The basal plate end with the occipital arch (OCC.AR.) that appears behind the auditory capsule (AUD.CAP.) ventrally and ends free. (Figures 1-3). The auditory region consists of two auditory capsules, they are approximately twothirds the size of the total cartilage at this stage and are completely separate from each other and are located between the basal plate. There are cartilaginous part observed in roof of auditory capsule and semicircular canal, which started from anterior semicircular canal (A.SC.CA. ), then lateral semicircular canal (LA.SC.CA. ), and finally posterior semicircular canal (Figures 6A and 6B). Ventrally, seen the focal wall of the cochlear portion of the auditory velum is very good, a large hole in the ventral wall of the cochlear cavity is known as the foramen perilymphaticum (F.PE.) which passes through the perilymphatic duct to enter the fissura metotica.in the anterior dorso-lateral wall seen a small hole called facial foramen (FA.F.). The processus ascendens (P.ASC.) former close to the auditory capsule from the anterior edge separately, it is a small cartilage located above the quadrate cartilage (Q.C.). the quadrate cartilage located on the ventral side of the auditory capsule. An almost elliptical cartilage appears below the quadrate cartilage and is bundled with the auditory capsule known as crista parotica (CR.PA.OT. ), it's formed mainly formed of lateral wall of auditory ventricle from lateral view of semicircular canal. Laterally, the crest of quadrate (CRE.Q.) appears as a small cartilage and above the quadrate. The Columella auris composed of two rudimentary parts not connected to each other proximal portion of Columella auris) PX.POR.) and distal portion of Columella auris (DS.POR) Which communicates with the hyoidarch by cartilaginous bar (C.BA.). Figure 6: A: A cross section of the auditory region show the auditory capsule and anterior semicircular canal. B: A cross section of the auditory region show the auditory capsule with anterior and lateral semicircular canals, also show the notochord between tow basal plate and Fenestra basicranialis.. Some chondrocranial structures is different from other lizard species. The olfactory capsule in nasal region on the chondrocranium is not yet complete, in orbital region the cartilaginous structure connected to each other. In present stage of Stenodactylus slevini, the olfactory capsule is more width than its length like some lizards, Ptychoglossus bicolor  and Ptyodactylus hasselquistii , and different in some turtles and snake such as Graptemys pseudogeographica, Emydura subglobosa, Trachemys scripta, and Malpolon monspessulana [26-29]. Fenestra olfactoria in this study is large, which is similar to the Trachemys scripta and Mabuya [30,31]. This property may be related to the sensory and chemical capacity and have well-developed of the olfactory bulbs. It's totally absent in snake; Malpolon monspessulana and Psammophis sibilans [32,33]. On the other hand, the fenestra olfactoria advehens in present stage form a wide incisura and not a closed foramen because no connection between the planum antorbitale and the nasal septum. In snake, the fenestra olfactoria evehens lacking because the sphenethmoid commissure absent. In present study we found that, the posterior processes maxillaries are present and is lacking the anterior processes maxillaries like in most lizards such as Acanthodactylus boskiana, while totally absent in Agama pallida, and in snakes such as the Psammophis sibilans and Malpolon monspessulana. In present stage the paranasal cartilages are completely ventrally fused with parietotectal cartilages portion that forms the concha nasalis which end blindly and open anteriorly by the Aditus conchae. While Zada, found the paranasal cartilage and concha nasalis are totally missing in Agama pallida. In this study, the ectochoanal cartilage is still not chondrified, which are supported by the process maxillaries like in some lizards such as: Chalcides ocellatus and Ptyodactylus hasselquistii, Psammophis sibilans and Malpolon monspessulana. In the present stage, the orbital region developed exceptionally well, in Stenodactylus slevini starting with the interorbital septum which isolate both eyes and nonstop from most rear of nasal septum, on the other hand reduced in Ophidia such as a Psammophis sibilans and Malpolon monspessulana. The planum supraseptale in this study starting to chondrify. it's originated from two separate centers and connected with each other in middle, is a special character among lizards, this corresponds to Ptyodactylus hasselquistii. Taenia marginalis extended from the lateral portion of planum supraseptale similar to the Ptyodactylus hasselquistii excluding the pila accessoria which was absent. In lizards, the Taenia marginalis in originate differently confined to a narrow and parallel with the enlargement of the brain, in present stage of this study, the Taenia marginalis extended from medial portion of planum supraseptale ends up free because the planum supraseptale is yet to be completed. However, Hernández-Jaimes et al. found that the in Ptychoglossus bicolor is formed independently of the chondrocranium cartilage elements. In laterally extend to the planum supraseptale anteriorly and posteriorly auditory capsule. In Natrix natrix, the Taenia marginalis has a complex origin from the confluence planum supraseptale process and pila accessoria. Both the pila accessoria and pila antotica are absent in Stenodactylus slevini agreement with study carried by Kamal  in Tropiocolotes tripolitanus, and unlike some other reptiles that are represented in turtles Emydura subglobosa and Graptemys pseudogeographica. In this study we found that, the floor of the neurocranium consists of the two trabeculae cranii which extends back to the basal plate, the acrochordal cartilage is absent in the present stage, the same results was found in turtles such as Trachemys scripta, Emydura subglobosa, also the same results was found in some ophidian such as Malpolon monspessulana and Psammophis sibilans, in Ptychoglossus bicolor, the basipterygoid processes developed from the acrochordal cartilage. The fenestra hypophysis and basicranial fenestra are different in shape and size among different lizards. In this study the fenestra hypophysis is small and triangular, which is enclosed by the trabeculae cranii, there are more than one type of turtles groups found, heart shape in Trachemys scripta, found oval shape in the Caretta caretta, and found rectangular shape in Graptemys pseudogeographica. This study gets a lot of details of chondrocranium anatomy and appearance of cartilages, this information compared with other reptiles. The basic differences in the anatomy of the chondrocranium specially in the two regions, orbital and olfactory regions. The orbital region is the most variable in the chondrocranium from other regions, as for the basal of chondrocranium and auditory region, there are very few changes. The aim of this study is to document the timing and significance of anatomical shifts in the development of chondrocranium skull and lizard's diversity. Our deepest appreciation goes to the Department of Zoology, College of the Scientific Sections, King Abdulaziz University and university of Jeddah for all assistance rendered during the course of this research. Camargo A, et al. Lizards as model organisms for linking phylogeographic and speciation studies. Molecular Ecology 2010;19:3250-3270. Carranza S, et al. Radiation, multiple dispersal and parallelism in the skinks, Chalcides and Sphenops (Squamata: Scincidae), with comments on Scincus and Scincopus and the age of the Sahara Desert. Molecular Phylogenetics and Evolution 2008;46:1071-1094. Pook CE, et al. When continents collide: phylogeny, historical biogeography and systematics of the medically important viper genus Echis (Squamata: Serpentes: Viperidae). Molecular Phylogenetics and Evolution 2009;53:792-807. Kapli P, et al. Molecular phylogeny of three Mesalina (Reptilia: Lacertidae) species (M. guttulata, M. brevirostris and M. bahaeldini) from North Africa and the Middle East: Another case of paraphyly?. Molecular Phylogenetics and Evolution 2008;49:102-110. Carranza S, et al. Relationships and evolution of the North African geckos, Geckonia and Tarentola (Reptilia: Gekkonidae), based on mitochondrial and nuclear DNA sequences. Molecular Phylogenetics and Evolution 2002;23:244-256. Arnold EN. Relationships, evolution and biogeography of Semaphore geckos, Pristurus (Squamata, Sphaerodactylidae) based on morphology. Zootaxa 2009;2060:1-21. Considine DM and Benton MJ. Lizards (Reptilia, Sauria). John Wiley & Sons Inc., 2002. Arnold EN. Reptiles of Saudi Arabia: a review of the lizard genus Stenodactylus (Reptilia: Gekkonidae). Fauna of Saudia Arabia 1980;2:368-404. El Din SB. A Guide to the Reptiles and Amphibians of Egypt. Oxford University Press, United Kingdom, 2006. Fujita MK and Papenfuss TJ. Molecular systematics of Stenodactylus (Gekkonidae), an Afro-Arabian gecko species complex. Molecular Phylogenetics and Evolution 2011;58:71-75. Metallinou M, et al. Conquering the Sahara and Arabian deserts: systematics and biogeography of Stenodactylus geckos (Reptilia: Gekkonidae). BMC Evolutionary Biology 2012;12:1-17. Sheil CA and Zaharewicz K. Anatomy of the fully formed chondrocranium of Podocnemis unifilis (Pleurodira: Podocnemididae). Acta Zoologica 2014;95:358-366. De Beer G. The early development of the chondrocranium of the lizard. Quart J Micr Sci 1930;73:707-739. El-Toubi MR and Kamal AM. The development of the skull of Ptyodactylus hasselquistii. I. The development of the chondrocranium. Journal of Morphology 1961;108:63-93. Kamal AM and Hammouda, HG. The development of the skull of Psammophis sibilans. II. The fully formed chondrocranium. Journal of Morphology 1965;116;247-295. Kamal AM and Abdeen AM. The development of the chondrocranium of the lacertid lizard, Acanthodactylus boskiana. Journal of Morphology 1972;137:289-333. Daniel JP and Christopher AS. Anatomy of the fully formed chondrocranium of Emydura subglobosa (Chelidae): A pleurodiran turtle. Journal of Morphology 2012;274:1-10. Danielson SC and Sheil CA. Patterns of chondrification & ossification in the skull of Graptemys pseudogeographica, the false map turtle (Emydidae). Journal of Morphology 2017;278:1739-1753. El-Toubi M and Kamal A. The development of the skull of Chalcides ocellatus. I. The development of the chondrocranium. Journal of Morphology 1959;104:269-306. El-Toubi MR, et al. The development of the chondrocranium of the snake, Malpolon monspessulana. Cells Tissues Organs 1973;85:275-299. El-Toubi MR, et al. The development of the chondrocranium of the snake, Malpolon monspessulana. Cells Tissues Organs 1973;85:593-619. HernÃÂ¡ndez-Jaimes C, et al. Embryonic development of the skull of the & ean lizard Ptychoglossus bicolor (Squamata, Gymnophthalmidae). Journal of Anatomy 2012;221:285-302. Jerez A, et al. Embryonic skull development in the neotropical viviparous skink Mabuya (Squamata: Scincidae). Mexicana 2015;31:3. Taylor WR and Van DGC. Revised procedure for staining and clearing small fishes and other vertebrates for bone and cartilage study. Cybium 1985;9:107-111. Tulenko FJ and Sheil CA Formation of the chondrocranium of Trachemys scripta (Reptilia: Testudines: Emydidae) and a comparison with other described turtle taxa. Journal of Morphology 2007;268:127-151. Wassersug RJ. A procedure for differential staining of cartilage and bone in whole formalin-fixed vertebrates. Stain Technology 1976;51:131-134. Yaryhin O and Klembara J. Different embryonic origin of the basipterygoid process in two species of Lacerta (Squamata: Lacertidae). Biologia 2015;70:4. Zada S. The fully formed chondrocranium of the agamid lizard, Agama pallida. Journal of Morphology 1981;170:43-54. Kuratani S. Development of the Chondrocranium of the Loggerhead Turtle, Caretta caretta. Zoological Science 1999;16:803-818. Gamble T, et al. Coming to America: multiple origins of New World geckos. Journal of evolutionary biology 2011;24:231-244. Kamal AM. The Chondrocranium of Tropiocolotes tripolitanus. Acta Zoologica 1960;41:297Ã¢ÂÂ312.